I guess I should have started out with a better description and visual of the trip. Here is a map that might help you see where we went. The RED circle is where we went at the Salton Sea. The PURPLE lines with arrows are where we were during the day and the GRAY lines with arrows are where the boat went at night. The furthest we went off the coast was 225 miles. You can see that we were north of Los Angeles at one point and it looks like we were in Mexico on the last night. 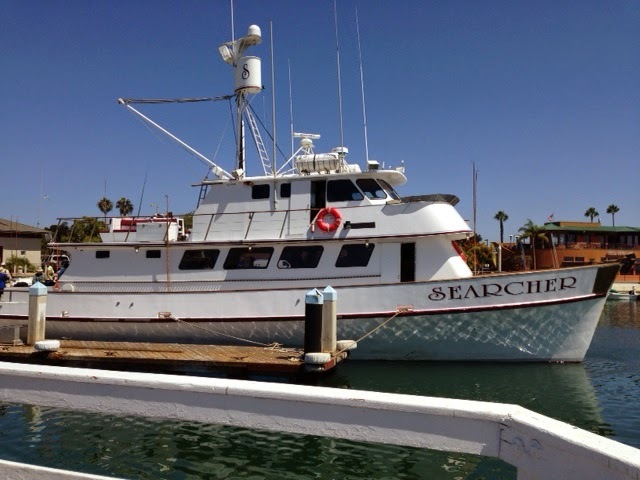 Oh, and I should have shown you a photo of the boat.The Searcher is 40 years old, 95 feet long and 24 feet wide. It's heavy and slow. It has 12 cabins below deck, a dining room, kitchen, 4 bathrooms (2 have showers), and an upper deck for viewing birds which is where Barbara and I spent most of our days. 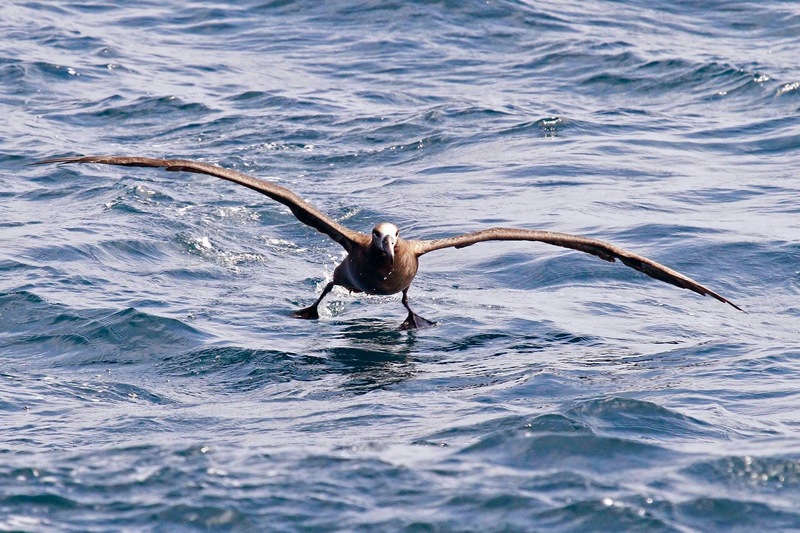 Bird highlights of the trip for me were the Black-footed Albatross. 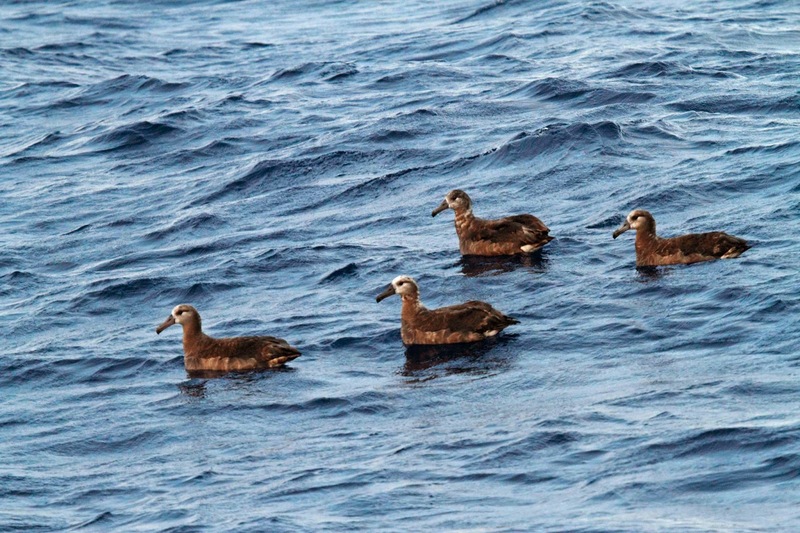 These birds are born on Midway Atoll - think battle of Midway, middle of the Pacific - and wander the ocean for years until they are old enough to breed and head back to Midway. They show up off of the California coast on a regular basis so the crew isn't surprised when they see one. 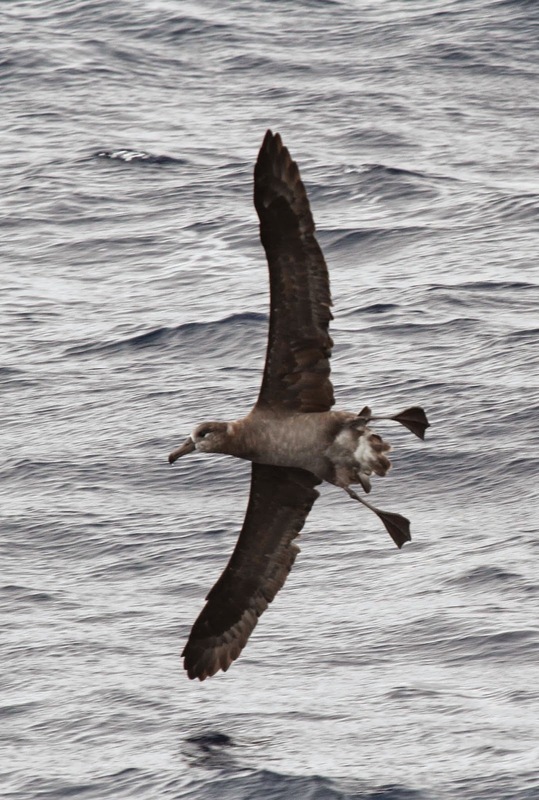 Still, it made my heart skip a beat when someone yelled "ALBATROSS!" and I saw this heading up the wake of the boat. This bird was probably born in April and already has a 7 foot wingspan! It is formidable right up until you see one try to land. Then, all majesty goes right out the window. They throw themselves into a tail spin, stretch out . . .
And come in for a landing with their black feet splayed out. Sometimes they trip themselves and go head first into the waves. What a riot. We was at least 5 of them over the course of the trip. On the last day, 4 showed up and sat together. What a great scene. 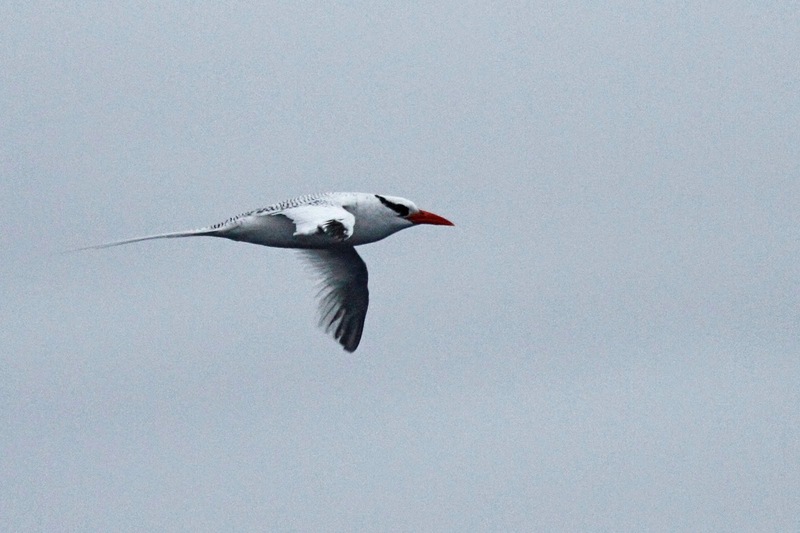 One of the other fan favorites on the trip was the Red-billed Tropicbird. They kind of look like terns but they are different. Somehow more exotic. I think it has to do with the long tail streamers. 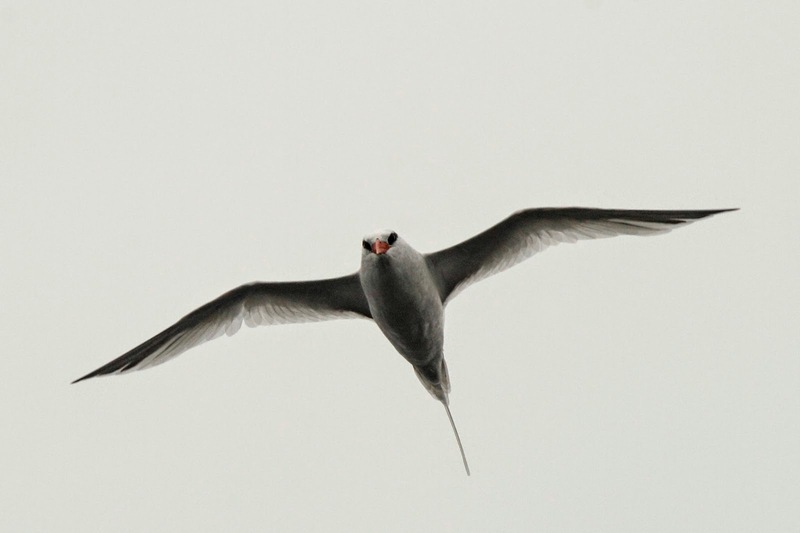 At one point, this bird hovered directly over the boat and really put on a show. Another one of the best birds on the trip for me was Sabine's Gull. I used to page through my field guide and wonder how anyone could tell one seagull from another. 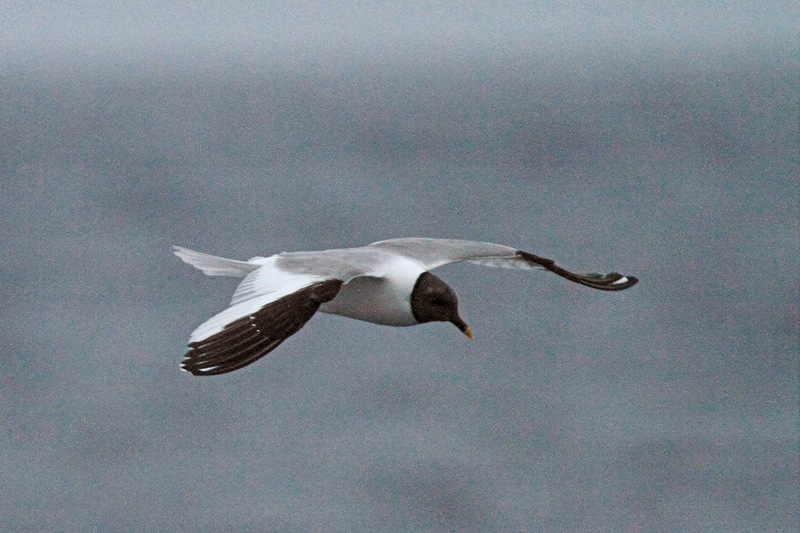 But I knew that the one gull that I could pick out would be Sabine's Gull. They are pretty rare in our area. I flipped when a few showed up behind the boat and flipped out when none of the photos turned out very good. Ugh. Look at the wing pattern on this gull. And the yellow tip on the bill. So, to wrap it up - the trip was a great success. Great birds, great sea creatures, great adventure and great friends to share it with. HA. I miss you too but I'm actually on a plane as I write this headed back to guess where? San Diego! Doing a workshop tomorrow that couldn't be scheduled any worse. Hope to see you soon.